I’ll deal with you quickly. 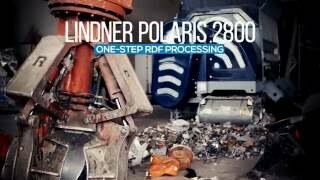 The Lindner Polaris makes short work of shredding, a real one-stop solution. This makes the production process more streamlined and cheaper compared to other technologies and also ensures an output quality so outstanding that it was given its own name: polaris material. And what’s more: the shredder technology is so innovative that it created a new market segment – one-step processing. For a one-step process, the shredder must be particularly sturdy and resistant to foreign objects in order to shred the broad spectrum of partially bulky input materials. The aim is cost-friendly processing with the lowest possible €/ton ratio for the operator and continuously steady output – freely selectable between 40 and 100 mm – that is ready to be incinerated in cement kilns/calciners or as a fluidised bed. The POLARIS, our compact shredder solution, meets all these requirements in the best possible way. In one-step shredding, the focus is on the shredder as a single-step solution. Untreated waste from households, commerce and industries is mostly fed into the primary shredder directly via wheel loaders, diggers or dosing hoppers with the aim of obtaining homogeneous, sortable material in a single step. The shredded material continuously trickles out of the base of the shredder. A stationary conveyor belt is conveniently located immediately underneath to transport the product. The ideal choice here is a profiled conveyor belt operated by the Lindner Shredder or the control room. Optionally, a permanent magnet can be fitted above the conveyor belt to securely extract ferromagnetic parts such as scrap iron and other ferrous scrap metal. Ferrous scrap metal in premium solid recovered fuels is said to spoil its quality. Once separated, it can be recycled in line with the circular economy concept. If you want efficient plants for turning municipal, commercial and industrial waste into fuel, you first have to define the end product. Especially in the single-stage production of fluidised bed fractions for incineration with energy recovery in cement-kilns/calciners, it is vital that the shredding systems work extremely robustly and reliably – and mostly around the clock. The calcinator accepts lower-grade fuels with regard to particle size and calorific value. Unlike in the rotary kiln’s sintering zone, much lower material temperatures (approx. 800–900 °C) are necessary as the CO2 simply needs to be extracted from the lime. A wide range of RDFs can be used depending on the calcinator type. With certain calcinators it is even possible to use entire tyres as fuel; however, most standard calcinators (e.g. inline, separate line and combustion chamber) use shredded refuse-derived fuels. Since there is a wide range of calcinator technologies and types, this table only serves as a guideline.